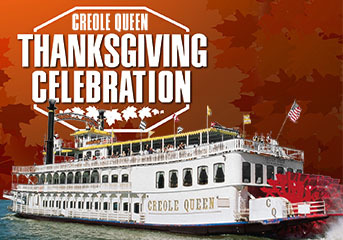 Relax this Thanksgiving by taking the family to the Paddlewheeler Creole Queen's Thanksgiving Celebration on the Mississippi River. Skip the stress of cooking a full meal and leave it to the Creole Queen. Enjoy a traditional Thanksgiving dinner feast with all the fixings, sides, and sweets. This being New Orleans you know we gotta have a little lagniappe, found here as a live jazz band will add a little spice to the Thanksgiving experience as the boat sails down the river.